Hello again! It's March and we're nearing St. Patrick's Day. We have a few little family traditions. They are pretty easy to adhere to. We like to eat corned beef and cabbage, wear green, and go visit Grandma Rose for her birthday since it falls the week before. Sometimes, we even go to the St. Paddy's Fair put on by our hometown church, if we are there the right weekend. One of my newer traditions is making homemade bread to go with dinner. I've tried a few variations on Irish soda bread, and this is by far the easiest. We love quick and easy, especially when it's tasty! 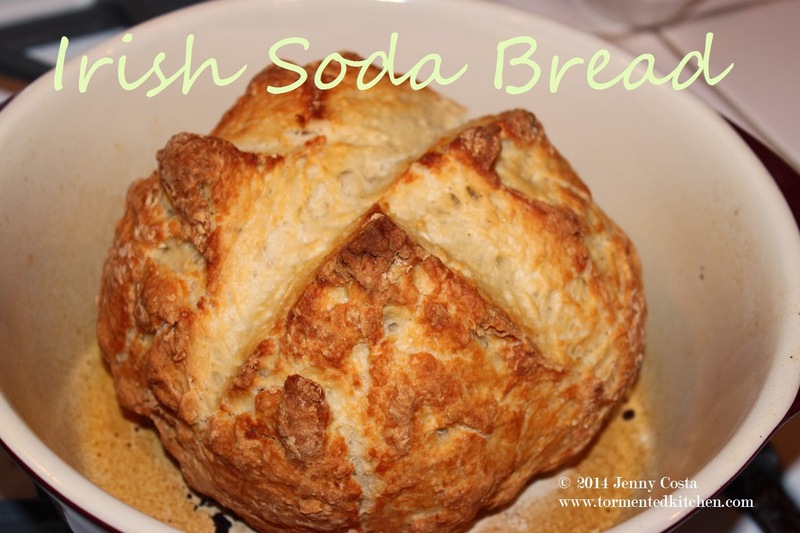 There are many, many different recipes for soda bread. I've tried to keep this true to what Irish people would have made historically. No raisins, no sugar, no fancy stuff. Just plain, hearty bread. This is not light and fluffy white bread. It's dense, chewy, and crusty. You will definitely want to load it up with butter and use it to sop up juices on your plate. I love that this is baked in a Dutch oven. I actually have a lidded Calphalon stoneware baker that is perfect for this. Le Creuset enameled cast iron French ovens are also great. You can use glass, stoneware, cast iron, or even two metal cake pans (one on top of the other to create a lid). The covered baking makes the crust really crunchy. If you like this technique, also check out my Basque Sheepherder Bread. 1. Mix together the dry ingredients. Add the buttermilk and mix with a big wooden spoon until it starts to hold together. You'll probably need to use your hands to finish mixing. 2. Knead a few times on a floured board. Do this so there isn't too much gas trapped, but don't over do it so the bread gets tough. It should be a bit crumbly looking. Roll and shape into a neat circle. 3. Slice an X on top of the loaf. Place in a greased and floured Dutch oven that is about 3 Qt size. Sprinkle salt on top of the dough, if desired. 4. Bake at 425F with the lid on for 30 minutes. 5. Remove the lid and bake another 15 minutes. The bread should sound hollow when tapped and be a lovely golden brown. Wheat: substitute 2 cups whole wheat flour for 2 cups of the AP flour. Keep the other ingredients the same. Extra smooth white: substitute 2 cups cake flour for 2 cups of the AP flour. Keep the other ingredients the same. *Sour milk is the same quantity of regular milk with a teaspoon or so of lemon juice or white vinegar added to it. Let it sit on the counter about 5 minutes before using in a recipe so it can thicken and start to look curdled.